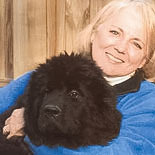 Marika Meyer of Meyer Interiors in Washington, D.C., was called a “Hot Talent” in 2011 by Home & Design Magazine, and in 2012 was named “One to Watch” by the Washington Design Center. She’s young and talented, and I have enjoyed watching this native of Washington, D.C. residential designer shine. She designs for lots of young families with children and pets that are looking for her signature style of sophistication that is timeless without forgetting functionality. She refers to it as “practical luxury and functional beauty”. I find her interiors to be elegant and transitional, welcoming and very stylish. My remarks are in the photo captions. The soft, light color and pattern on the walls, against white trim, black bench, stair balusters & front doors creates a cohesive look. While traditional, it still feels modern. The woven sisal rug adds an organic touch. A welcoming kitchen. While all the cabinetry is white, Meyer used 2 different counter materials, one, the marble, light, the other dark wood, the color which repeats in the over the counter lights, the table & chairs, and the bits of dark color in the window fabric. The pop of red in the stools is echoed again, in the window fabric and the carpet under the table. The light walls from the foyer continue in the kitchen. The family room is open to the kitchen in the previous photo. 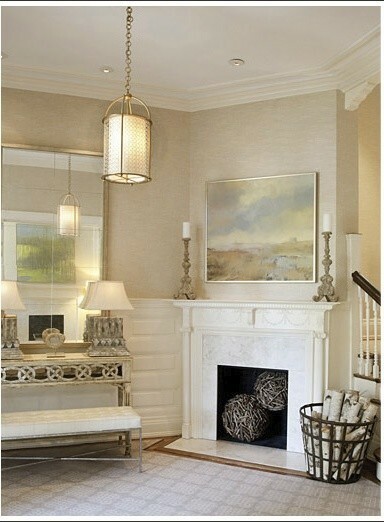 Natural stone fireplace, soft colors on drape fabric against reed shades. The pillows and the ottoman pick up the browns from the kitchen. 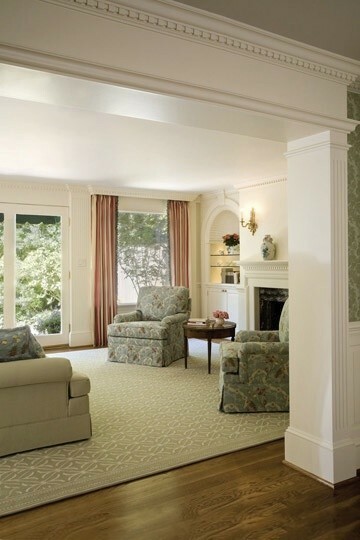 The coffered ceiling with beadboard keeps it from being too formal. Masterful use of pattern. In another home she uses soft blues and creams to create a restful sitting area. The book’s binders are grouped together by color. Another view of the same room. Lovely vignettes in the bookcase. In this room there is considerable use of pattern, but with muted colors, and a neutral background, it works. Notice the patterned rug on top of the sisal, and the geometric pattern on the back of the bookcases. Lots of light. Monochromatic, with the blue from the art repeated in pillows, and books on the table. The black of the piano is repeated in the fireplace and candles on the mantel. The tall lamps add a sculptural element to the room. No window coverings in these deeply recessed windows, but folding shutters. At first glance it looks like this is a different view of the last room, but this is not. Notice the raised panels to the left of the fireplace. The art may be by the same artist as the last room, as it has a similar feel. 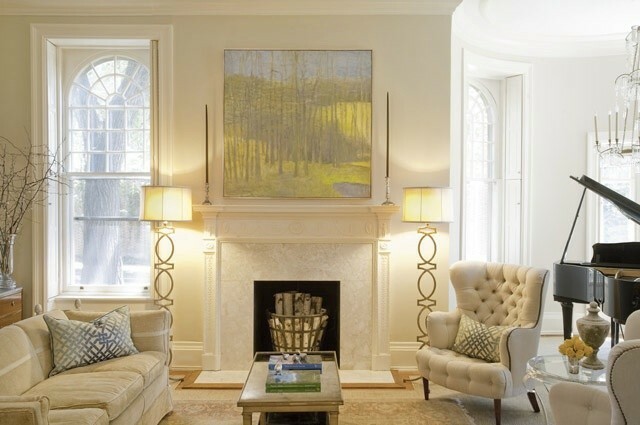 The huge mirror to the left of the fireplace, reflects light and the art back into the room. Love the balls in the fireplace opening that tie in with the birch logs in the metal basket balancing out the weight of the table, lamps and bench. In this roomI like the use of wood blinds above and beside the doors , as well as the side windows. Notice the horizontal and vertical bands of trim. 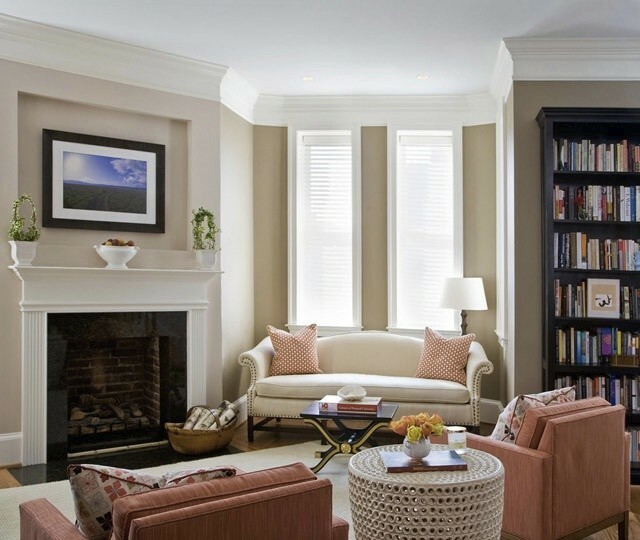 The trim casings and in the room between the window and the french doors, and around the bookcases flanking the fireplace lend detail to a rather large room. More traditional than the previous ones. Here blue walls, pop against the dark brown of the chairs and grand piano. The prints on the wall are a nice play on the bookcase doors. To the right you can see a different pattern in the area rug, but the colors are repeated in both rooms, bringing a nice cohesiveness. 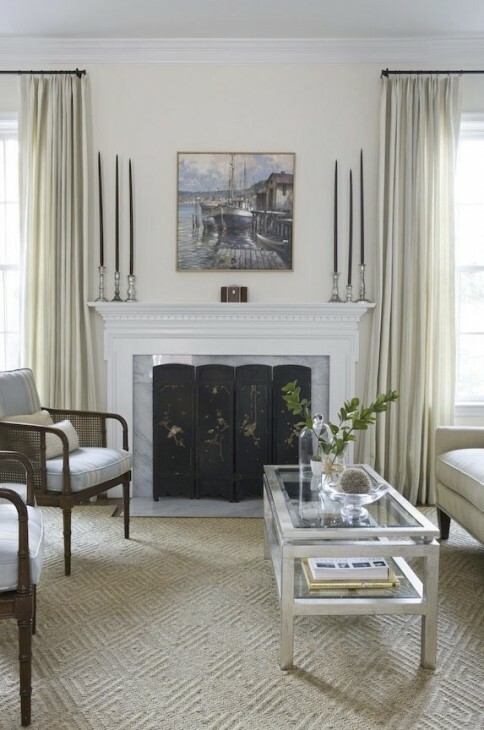 Here black fireplace surround, black framed art, and black bookcases balance the room because of how they are placed. The coral color in the furnishings can be seen in hints on the bookcase books. Beautiful crown moldings. 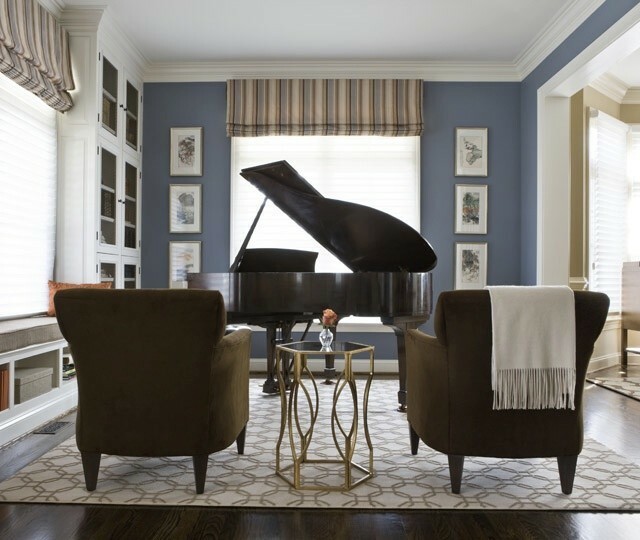 Sisal rug color is repeated in this monochromatic room, with the bolder color coming from the fireplace screen, wood chairs, and the matting in the art work hung on the wall, and the piano. 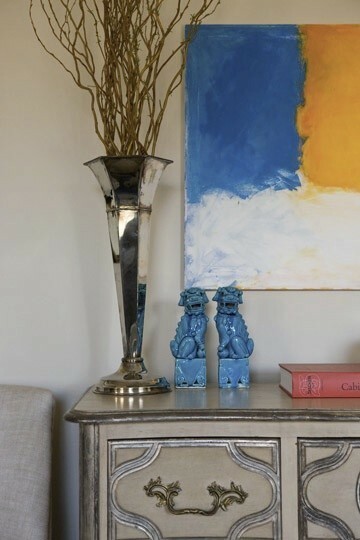 The blue color in the art above the fireplace repeats in the fabric on the chairs. She uses metal tables pretty consistently, and well. Another view of the same room. Notice the tall candles……quite striking and elegant. 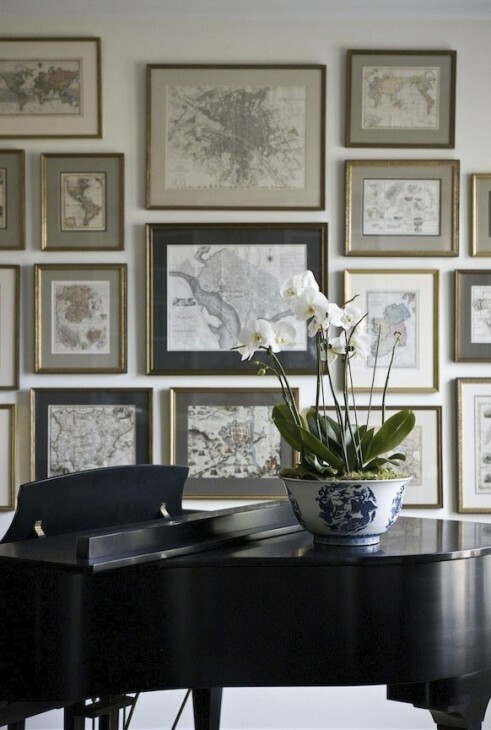 Close view of the framed antique maps and the matting. All gold frames keep it from becoming too busy and chaotic. The mats are shades of the colors in the art work, again subtle variations. 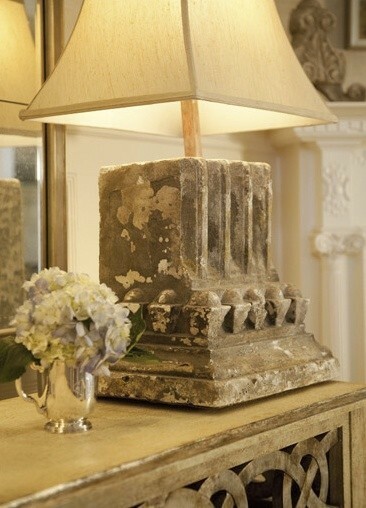 Here a lovely eclectic vignette. Gorgeous. I love the soft blues and creams. The kitchen is beautiful with dark and light colors. Thanks for sharing!